Located in a popular residential location is this three storey split level mid terraced house, with a balcony to the front offering views across the town. This gas centrally heated and double glazed property offers versatile living accommodation which comprises: on the ground floor - former integral garage which could be utilised as bedroom 3, hobbies room or general store room, bathroom and WC, first floor - open plan living room/kitchen, second floor - two double bedrooms and a shower room. This mid terraced house is situated in a popular residential area of Exmouth, which has a good variety of local shops, pubs and restaurants. Exmouth seafront has the much favoured marina area and the Exe Estuary. The coastline known as the `Jurrasic Coast` has many beaches including Budleigh Salterton, Sidmouth and Lyme Regis. Exeter is approximately 10 miles distance with mainline railway links and the International Airport. Covered storm porch. uPVC outer door opens into entrance hall. Water tap. Wall mounted gas combi boiler. Inner door opens into further inner hall, with built in storage cupboard and shelving above. Doors leading to downstairs bathroom and former garage bedroom 3. Low level WC. Central heating radiator. Opening into former store area which currently has a corner bath in situ. This valuable room would ideally suit someone looking for alternative space for a ground floor bedroom, workshop area or hobbies room. Double glazed window to front aspect. Spotlights to ceiling. Central heating radiator. From the inner hallway, stairs rise to first floor. Central heating radiator on stairwell. This bright and airy room has a living area with a kitchen incorporated offering a very sociable room for entertaining. The room has been measured in two sections. Double glazed windows to front aspect with sliding door opening on to the enclosed balcony. Two central heating radiators. Spotlights to ceiling. Built in shelving. Television point. Double glazed window and door to rear. The kitchen is fitted with a matching range of floor and wall mounted cupboard and drawer units with work surfaces over. Butler style ceramic sink unit. Built in electric oven with four ring gas hob. Space for washing machine and fridge/freezer. Tiled flooring. Built in storage cupboard. Door to rear lobby area. Doors to bedrooms and shower room. An L shaped room. Double glazed window to front aspect. Built in mirror fronted wardrobe with sliding doors. Further built in storage cupboard. Double glazed sliding doors opening to the rear garden. Central heating radiator. Skylight window. Corner shower cubicle. Low level WC with cupboard above. Pedestal wash hand basin. Heated towel rail. Tiled flooring. From the rear of the second floor, a double glazed door opens out into the rear garden. The property was built with an internal garage at ground level, but this has been informally converted to provide an additional room. There is parking for one vehicle on the drive to the front of the property. There is a very small courtyard to the rear at the first floor level. Access to the steeply terraced rear garden is via a door to the rear of the second floor. This provides access to a metal grill decked area which leads to steps up to the rear terraced garden. At the top level is are views towards the Exe Estuary and a summer house with power and light supply. The property is FREEHOLD and was built in the mid seventies. 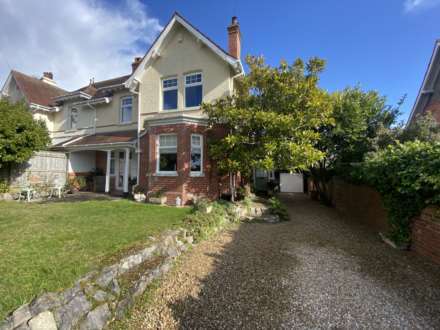 From our prominent Town Centre office, proceed out of town along Salterton Road. At the traffic lights, turn left, signposted to Exeter, onto Claremont Lane. Proceed through the traffic lights, down the hill and turn right into Ashleigh Road. The property will be found on the right hand side, clearly identified by our For Sale sign.